I did manage to get a little knitting accomplished this weekend. 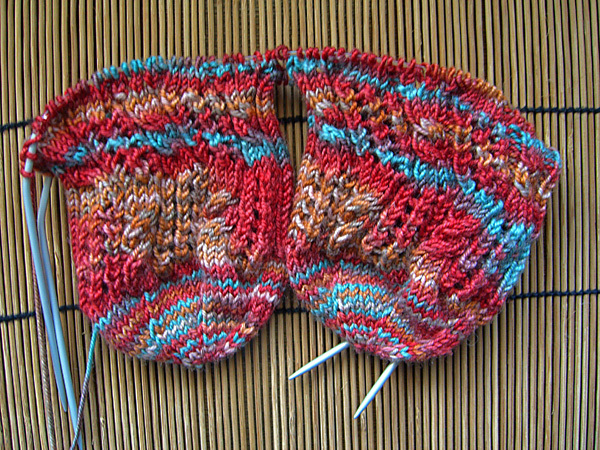 The Tipsy Knitter socks haven’t progressed much since Thursday. I’m working on the third set of ladders, which is the second pattern repeat. Isn’t it fun how the ladders and cables tilt first one way and then the other? I’m not wild about colors pooling. But I have to say that with this pattern the way that the colors are pooling is actually pretty cool. I didn’t work on the socks that much this weekend because I decided that I really should actually finish one of my UFOs. We have sweater-weather at least through June, and I’d really better knit on a sweater before it got too hot to even contemplate. This is a shirt-style sweater that I’m making up as I go along. It will be mostly stockinette stitch. But I decided I wanted my shirt to be ruffled. 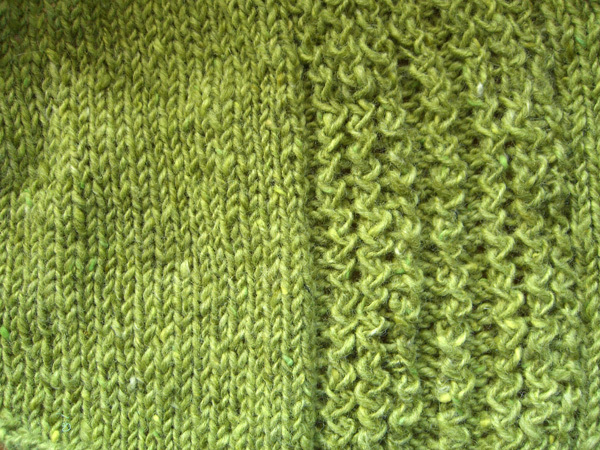 The twisted rib to the right in the picture represents the “ruffles.” This is the right front of the sweater. I knit mostly on the sweater this weekend, and it has grown to be about 12″ long. I need about another 8″ before I start the armhole shaping. I’m also getting ready for the next sock class, and knit a new color-coded sample sock. On Sunday I drove up to Scapoose for coffee with K. I was very careful to look at my feet before leaving the house. I think they are hoping to reach Whitehorse by tomorrow, and Anchorage by Thursday. I am still thinking clear-road thoughts.